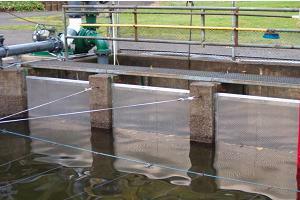 NCSSEF funds were used to purchase new aluminum pond screens for Trask Hatchery. The screens were installed on the two largest rearing ponds to replace older, wood framed screens. The new screens allow for smaller mesh sizes to be switched with larger sizes as fish grow in the pond. This causes less restriction and allows more water flow through the ponds, which allows the ponds to be cleaned more quickly, contributing toward a healthier, less stressful environment for juvenile fish.